Your Environmentally Friendly Die Cutter - Marian Inc.
You are here: Home / About Us / News + Events / Marian News / Your Environmentally Friendly Die Cutter – Marian Inc. According to iso.org, being ISO 14001:2015 certified means that “an organization considers all environmental issues relevant to its operations such as air pollution, water and sewage issues, waste management, soil contamination, climate change mitigation and adaptation, and resource use and efficiency”. This certification also requires an organization to continuously improve their standards in regards to their environmental efforts as well as heavily involve the company’s leadership in these efforts. Our Quality Policy states that we aim to satisfy our customers, continuously improve, and create a better work environment, a statement that aligns very closely with ISO’s requirements. 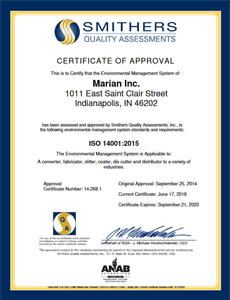 This means when you work with Marian, not only are you getting the highest quality products, but you can also be sure we are conducting business in a “green” manner. Click the button below to learn more about our quality policy and other certifications. 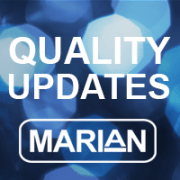 Marian can provide solutions to your most difficult problems in a highly efficient manner. If you’re interested in learning more about our wide variety of value-adding capabilities and our various green initiatives, give us a call at (800) 733-0062 or fill out our Contact Us Form and one of our dedicated material specialists will be in touch.